Origin and Habitat: Guanajuato, Hidalgo, and Querétaro (extent of occurrence ca 15,000 km2). The species is rare across its range, severely fragmented and known from a total of 20 subpopulations. Altitude range:* Between 1000 and 2400 metres above sea level. 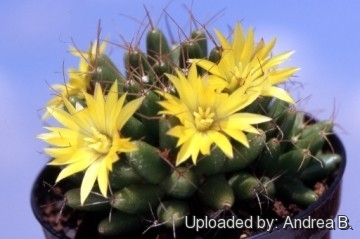 Habitat and Ecology: This cactus is found on limestone and in volcanic soils, under low shrubs and sparse vegetation together whit: Astrophytum ornatum, Mammillaria wildii, Echinofossulocactus anfractuosus, Selenicereus spinulosus, Ferocactus glaucescens, Ferocactus histrix, Echinocactus platyacanthus, Brahea dulcis, Myrtillocactus geometrizans, Cephalocereus senilis, Stenocereus dumortieri, Opuntia imbricata, Echeveria coccinea, Tillandsia grandis, Hechtia podantha, Agave stricta, Agave celsii, Fouquieria purpusii, Bursera morelensis. 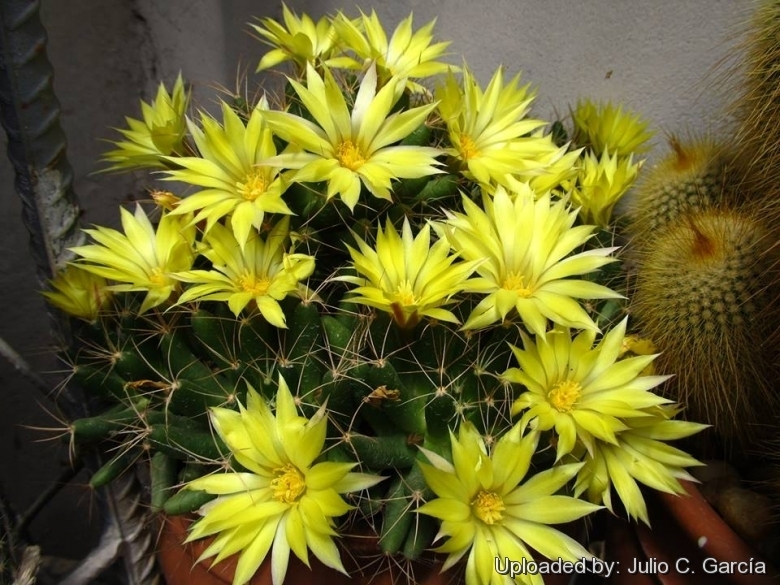 This cactus is illegally collected in the wild as an ornamental, although this is localized. In some areas this species is trampled by cattle ranching. Mammillaria longimamma f. cristata hort. 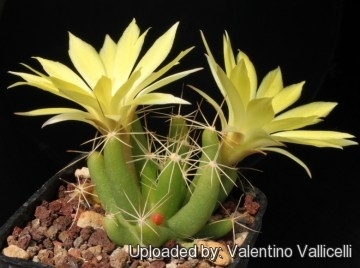 Cactus longimamma f. cristata hort. Dolichothele longimamma f. cristata hort. Neomammillaria longimamma f. cristata hort. Mammillaria longimamma var. gigantothele O.Berg in C.F.Först. Mammillaria longimamma var. uberiformis (Zucc.) K.Schum. Mammillaria uberiformis Zucc. in Pfeiff. Mammillaria longimamma f. variegata hort. 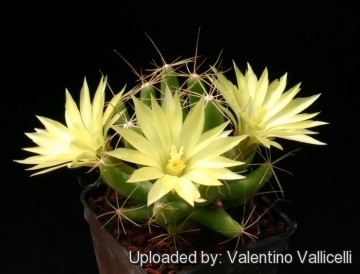 Cactus longimamma f. variegata hort. Dolichothele longimamma f. variegata hort. Neomammillaria longimamma f. variegata hort. Description: At first solitary, but clustering very young and forming dense clusters to 15 cm or more broad. With 10-30(-50) branches. Stem: Spherical, green, 3-6(12 cm) cm in diameter, up to 10 tall. Without latex. Tubercles: Very long soft and flaccid 12-25 ? 5-8 mm. the axil is sparsely woolly, without bristles. Radial spines: About 8 to 10 for 12 to 20 mm long white-yellowish or brown. Central spines: Usually 1 central spine, to 25 mm long, not hooked or curved, similar to radial spines. No Central spine for the var. uberiformis. Flowers: Very large for this genus, 4-6 cm long, 4.5-6 cm wide with bright yellow petals in May-July; stigmas yellow. Roots: Thick taproots, large in upper portion. Mammillaria longimamma DC. : Plant with very long soft and flaccid tubercles. 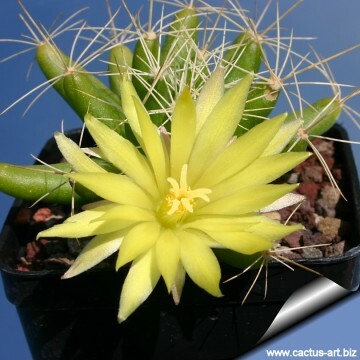 Radial spines 8 to 10 for 12 to 20 mm long white-yellowish or brown. Central spines 1 up to 25 mm long. Mammillaria longimamma f. cristata hort. : Crested form. 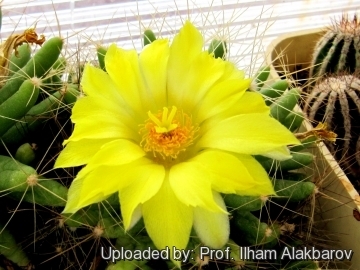 Mammillaria longimamma var. uberiformis (Zucc.) K.Schum. : Very similar to standard longimamma but with no central spine. Mammillaria longimamma f. variegata hort. : Variegated form. 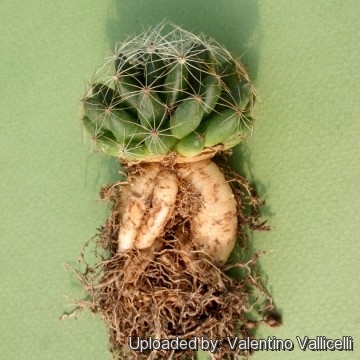 6) Ulises Guzmán, Salvador Arias, Patricia Dávila, “Catálogo de cactáceas mexicanas” Universidad Nacional Autónoma de México, Mexico 2003, p.114. 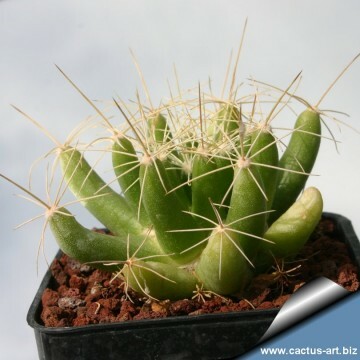 Mammillaria longimamma Photo by: Andrea B.
Cultivation and Propagation: An easy species that will form large clumps with age. 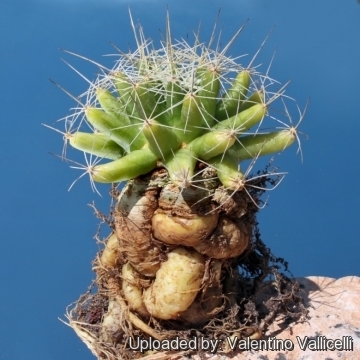 Mammillaria longimamma has a fairly large tap root, and should be kept in a deep pot with a very draining mineral substrate. Watering during the active growing season (spring and summer); this will encourage steady growth, and prevent the large tubercles from becoming flabby. But be careful with watering, which all thick rooted species require (rot sensitive). Keep dry during the winter rest, when the plant may pull near the surface of the potting mix. Fertilize every 2 weeks with diluted high potassium fertilizer when the plant is in bud. Need light shade to shade.